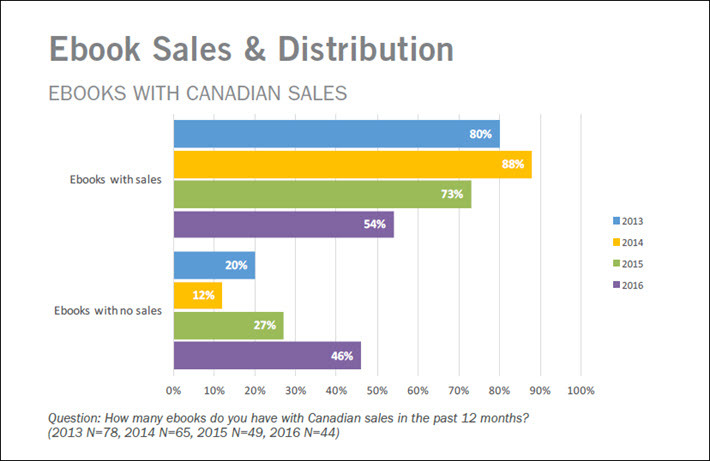 Toronto-based Kobo and Seattle’s Amazon are neck-and-neck in Canadian publishers’ use of ebook retailers, BookNet Canada finds. And ebook sales are down while digital revenue is up for some. In its newly released (June 6) State of Digital Publishing In Canada report for 2016, BookNet Canada cites rising digital revenue reported by 61 percent of responding publishers in 2016. This, of course, will raise eyebrows among industry leaders in the USA and UK, where “the ebook plateau” has become a favored meme and a “print resurgence” is a much-valued concept. But there’s an interesting flip side to this. “At the same time,” write staffers of BookNet—the nonprofit service group for Canadian publishing—”the percentage of ebooks with sales has declined once again, from 88 percent in 2014 to 73 percent in 2015 to 54 percent in 2016. And notes on several other talking points from the report read this way: “Other highlights include a significant increase in the number of publishers producing digital audiobooks–which rose by 11 percent over 2015–and a 20-percent jump in the number of firms utilizing the agency pricing model for their ebooks. In 2016, 71 percent of [Canadian] publishing firms reported using that model. Michael Cader at Publishers Lunch is offering an important caveat, noting that The State of Digital Publishing in Canada, an annual report, is a survey of 50 responding publishers, not the marketplace data exercise we frequently see conducted by Nielsen or NPD and others. It’s interesting, though, to note that communications with the report from Toronto include this commentary from consumer survey work: “According to research conducted by BookNet Canada, in a series of surveys of book-buying Canadians, ebook sales in Canada declined by just over 2 percent between 2015 and 2016 (from 19 to 16.9 percent). 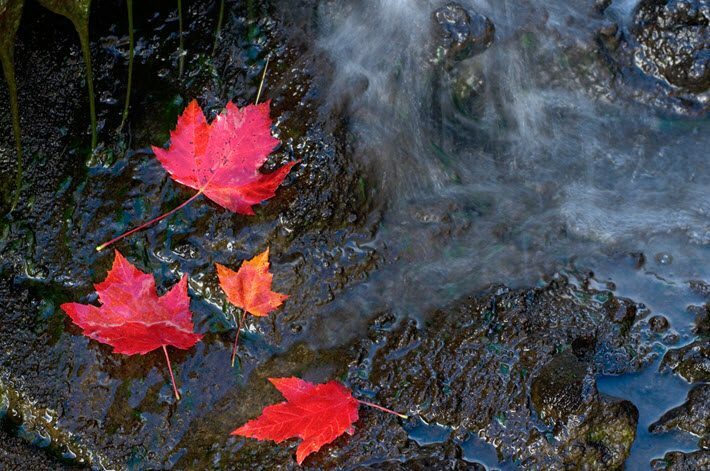 This is the backdrop, then, against which these new snapshots of the Canadian market are drawn. Respondents are 52 percent publishers only; 44 percent both publisher and distributor; and 4 percent self-publishing. Ninety-two percent of respondents are headquartered in Canada. Of these respondents, 12 percent are classified as large (more than $10 million in annual Canadian revenue); 29 percent are classified as medium-sized ($1 million to $10 million in annual Canadian revenue); and 59 percent are designated as small or self-publishing, with less than $1 million in annual Canadian revenue. 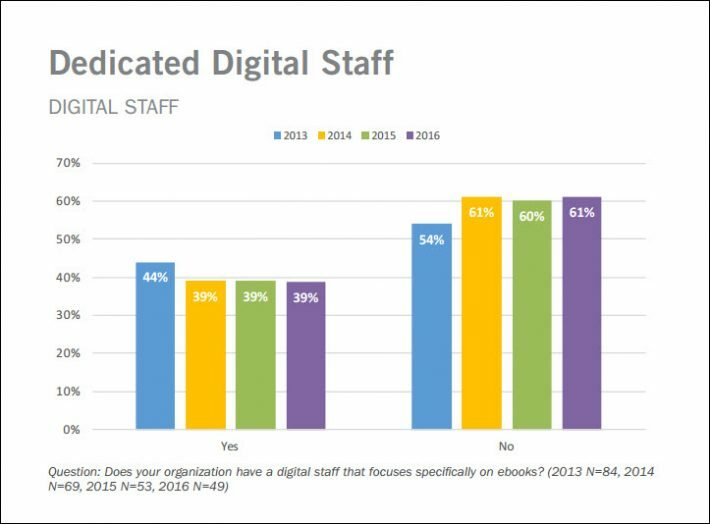 The results show a relatively static response over the years in which the majority of responding publishers have answered no–no dedicated digital staffing. 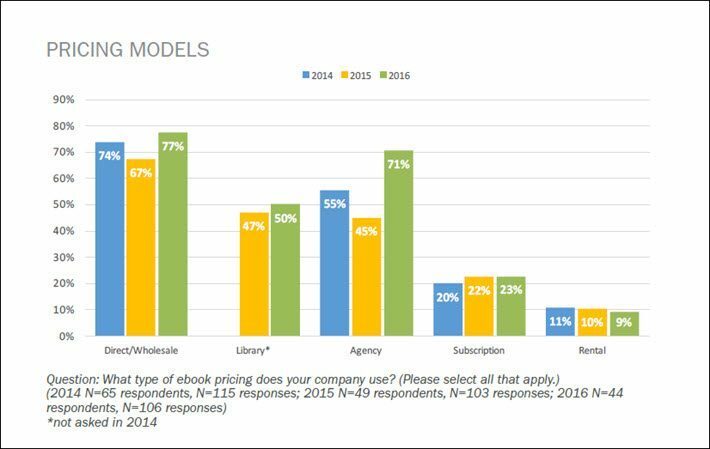 In discussion on the question of pricing models, the BookNet team writes, “Firms appear to be utilizing a variety of pricing models, with a significant increase of more than 20 percent for agency pricing (71 percent), and a 10-percent increase from 2015 to 2016 for direct/wholesale pricing (77 percent). 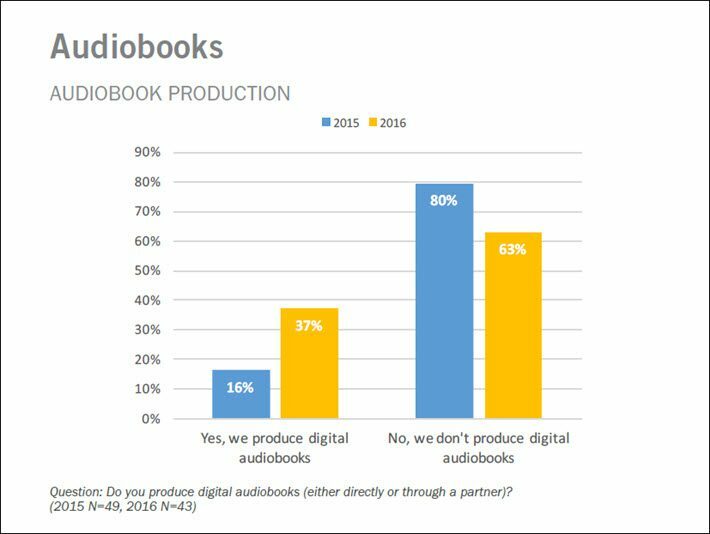 In its discussion on the subject of audiobooks, BookNet Canada writes, “In 2016, 37 percent of firms reported producing digital audiobooks; this number is up from 16 percent in 2015. More is available from BookNet Canada, the full survey running to some 30 pages. You can see the full presentation here.